It was decided to rebuild the historic centre of the city exactly as it had been. In 1938 an art teacher had asked his pupils to draw each of the buildings together with a written description. The records were hidden underground in a coffin during the war years and recovered afterwards. 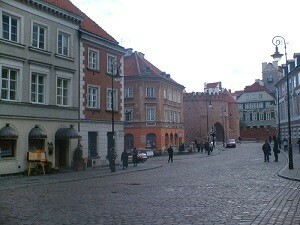 The reconstructed old city was not built as a theme park or tourist attraction, but a living centre. It is sufficiently splendid and accurate to have been made a UNESCO World Heritage Site. The Communist regime refused permission for the reconstruction of the Royal Palace until 1971 It took 13 years to complete. The work was financed by public donations and fund raising. It includes works of art that were looted by the Nazi’s and returned after the war. Others have been reproduced. The rooms are a triumph of modern craftsmanship. The Royal Way links the Palace with Lazienki Park and features a variety of attractions including churches, monuments, the Presidents Palace, Warsaw University and Burghers houses. Lazienki Park was part of the German sector during the 2nd World War and was spared the total destruction of the rest of the city. The Royal Lazienki Palace is set in parkland and known as the Palace on the Lake. The area was originally a medieval hunting forest The current building was constructed in the late 18th century. With so much wartime destruction and much of the land in Warsaw without owners, the authorities were able to leave areas of open space during redevelopment. 30% of the city is now parkland. 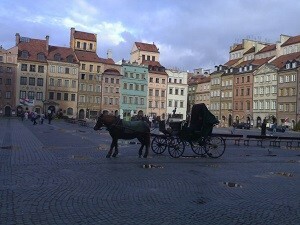 Close to the old centre is the area that was the Warsaw Ghetto. There is a moving monument in a small park as well as another at the site of the railway station that was used to transport jews to the death camp at Treblinka. Although many buildings in Warsaw are reconstructed, there are also large areas of blocks build to house the population of Warsaw quickly and cheaply. The best known building in Warsaw is probably the Palace of Culture, a ‘gift’ to Poland from the Soviet Union, and an example of the public architecture of the communist period. It’s architecture is a statement of the power of the state. People still visit to view the city from it’s upper balcony.